If life is art, then your home should be your gallery. That’s the mantra behind The Residences at Utopia, 90 fresh and modern new condos located at 2871 Jacklin Road in Victoria’s West Shore. The units were composed with space efficiency and easy living in mind. Beyond mere function, The Residences at Utopia puts the spotlight on fashion – with the aim of encouraging owners to make each space uniquely theirs. Buyers can choose from over 20 decor packages – including colour palettes, materials and textures – to truly define their custom space. Other style highlights, such as sunken kitchen ceilings, soaring lofts, designer lighting and modern finishings give this West Shore residential project a distinctly urban feel. Useful features like soft-closing cupboards and drawers in the kitchen and bathrooms, air conditioning in every unit, built-in air filtration, and heated tile are just a few of the perks owners can enjoy. 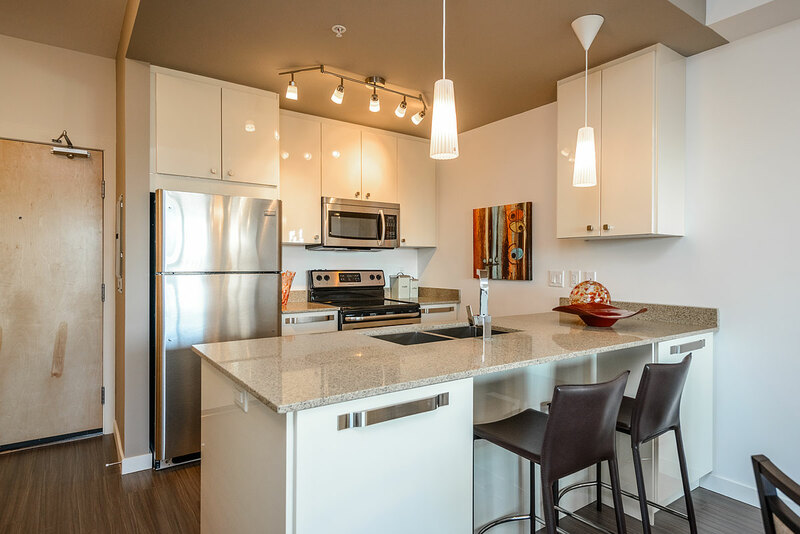 The Residences at Utopia are located within close proximity to all of the West Shore community amenities, and steps away from the major bus routes to downtown Victoria. Recreation centres, schools, shopping and parks are an easy stroll or cycle from the front door. Parking stalls – as well as a limited number of undercover spaces – are also available. With a well-planned array of unit configurations, the development is well-suited to everyone from growing families, to downsizers, to single professionals.